This map is included in William Bunge’s book co-authored with R. Bordessa, “The Canadian Alternative: Survival, Expeditions, and Urban Change.” The Doctorless Zones map is one among a series that highlight the divisions between Bunge’s idea of three cities: rich, workers, and slums. He calls the the City of Superfluity, the City of Need, and the City of Death. As can be seen on the map, the inner city (City of Death) is seriously lacking health services. 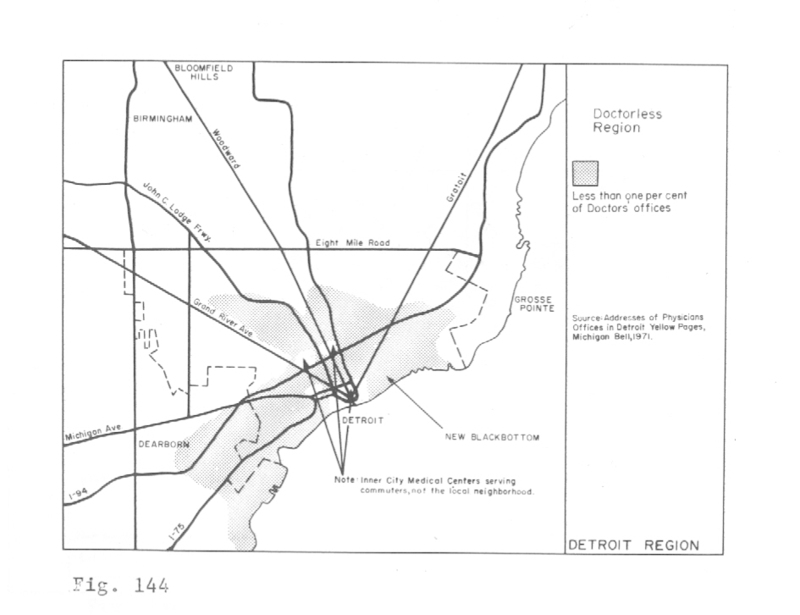 There is a similar problem today where large areas of Detroit do not have any primary care or family doctors available, infant mortality is high, and there aren’t even easily accessible urgent care centers.